Smooth intricate shapes and contours on your workpiece with these flap wheels that conform to the surface of your material. 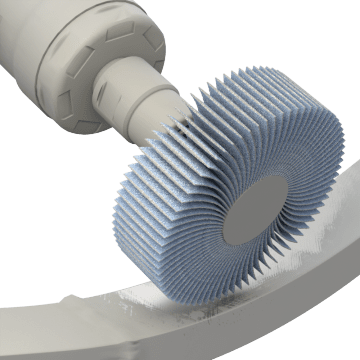 The grit on the wheel flaps cracks as it is used, exposing fresh abrasive to provide a consistent finish with a uniform rate of cut. Attach a flap wheel to a compatible bench grinder, portable die grinder, or drill. Flap wheels are typically used in metal fabrication and welding applications including stock removal, blending, deburring, and polishing. Lock these wheels with threadless shanks into the collet of your compatible power tool to quickly connect or disconnect your flap wheel. 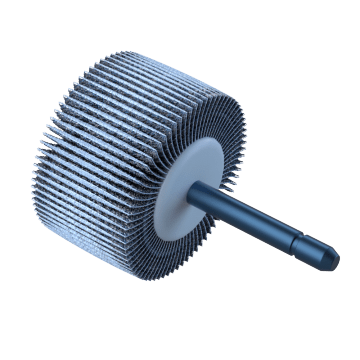 They have an integrated steel shank, which gives these wheels better balance and creates fewer vibrations than flap wheels without a shank, resulting in more even finishes and less operator fatigue. Quickly spin these threaded flap wheels on and off of die grinders and drills without needing special tools. 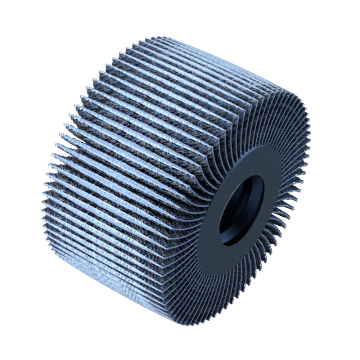 The integrated threaded shank is typically shorter than threadless shank flap wheels, making them a good choice for detailed work where you need to have maximum control over the wheel, such as polishing and finishing surfaces. Connect these flap wheels to compatible power tools that have an existing arbor. Match the center hole diameter (for unthreaded arbors) or center hole thread size (for threaded arbors) to your tool's arbor to attach. The flaps are made of woven cloth covered in abrasive grit that provides a consistent surface finish and helps prevent gouging of your material. 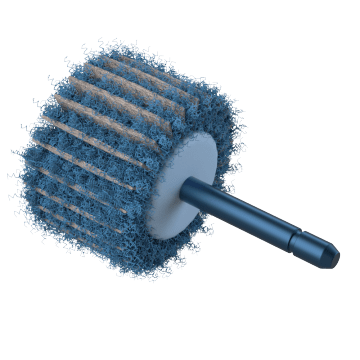 Remove material, clean, and finish your surface in a single step with these abrasive-mesh flap wheels. 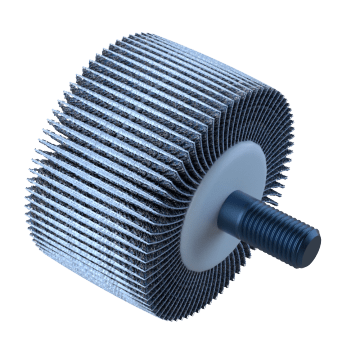 Also called interleaf flap wheels, they have flexible abrasive flaps for cutting surrounded by nonwoven, cushioning material for creating a fine finish. These wheels are good for blending, removing oxidized material, and cleaning welds. 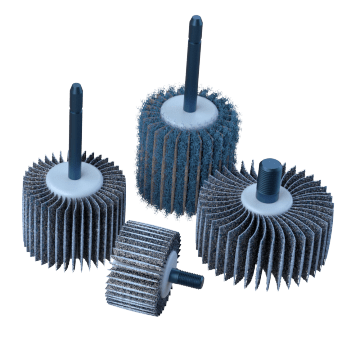 Keep a range of flap wheel diameters and grits on hand for a variety of finishing applications with these sets. They are also useful when testing different diameters and grits to make sure you have the right wheel for your workpiece.